Good morning! I'm super excited this morning to be hopping along with Heffy Doodle Stamps to celebrate the newest release - tons of inspiration, and of course a giveaway as well! Read all the way to the bottom for more info on that! I have a super bright and fun card to share with you today featuring the new Bots of Love Stamp Set! I colored up those adorable robots - because I wanted to use them all! 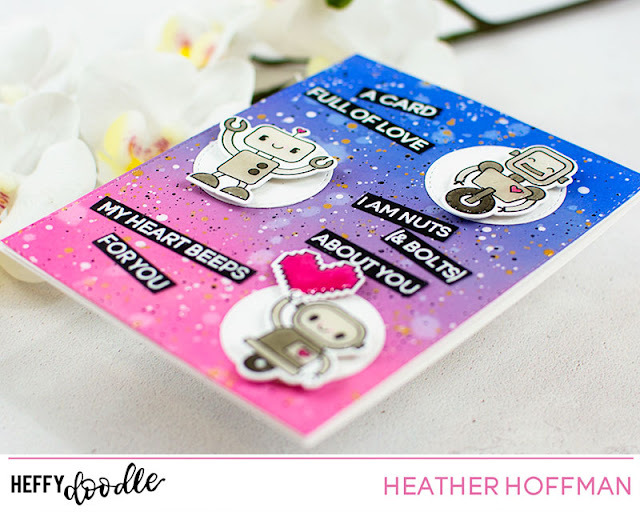 I also colored one of the little hearts in the set, then die cut them all out with the coordinating Bots of Love Dies. I also heat embossed several of the sentiments on black cardstock and die cut them out using Strips of Ease Heffy Cuts. The background was some fun ink blending with Distress Oxides - this used a combination of Picked Raspberry, Wilted Violet, and Blueprint Sketch. I also added some water splatters, then white splatters with thinned down white paint, some black splatters with Pinkfresh Studio's Licorice Liquid Watercolor, and some gold splatters with my Starry Colors Palette! Yep - when in doubt, add ALL the splatters! LOVE all the texture this adds! Once it dried well, I die cut it with Imperial Stitched Rectangles. 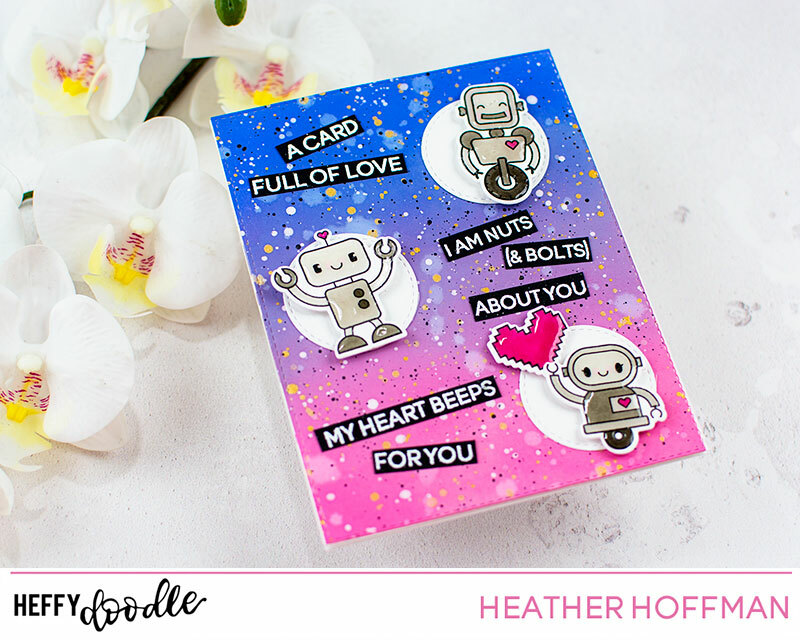 I also die cut some small-ish circles with Stitched Circles Dies, and then layered everything on my card, adding the robots with foam adhesive. As a final finishing touch - I added Glossy Accents to coat each entire robot! LOVE the gloss and shine - you can see it best in this photo! 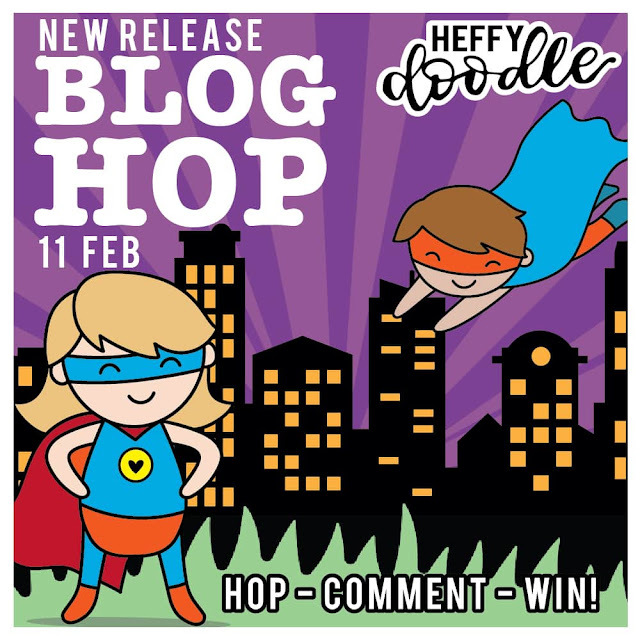 One random winner of a £50 gift certificate will be drawn from someone who leaves comments across the entire blog hop! Comments must be left by 11:59 PM PST on February 19, 2019. Winners will be announced on the Heffy Doodle Blog on February 20, 2019. Also - don't forget the free ADORABLE Rescue Dogs Stamp Set set, free with orders over £30 - and with orders over £45 you receive the dies for free as well! I love seeing all those sentiments on the one card! Beautiful colors! I love the bright oxide background combined with the robots! Your background is so fun. Those little bots are having a great time! Such a cute card! Love the colors and textures! The robots are so sweet and your sentiments are perfect! Oh, how I LOVE these robots. AND the pixilated heart! Awww!!! Too cute and funny!!! The robots are adorable. My son would go crazy for them. 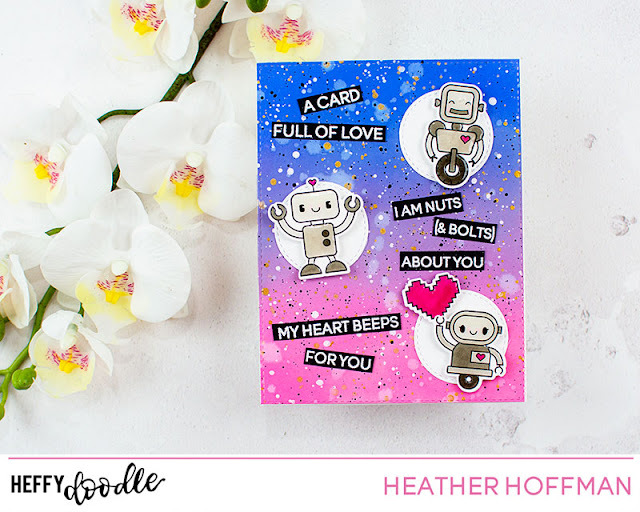 Happy, funny card; great background, and I love the Glossy-Robots ! gears are a great combination. Love your color choices. Like the glossy accents on the robots. Oh, I've fallen head-over-gears for this card and stamp set!! 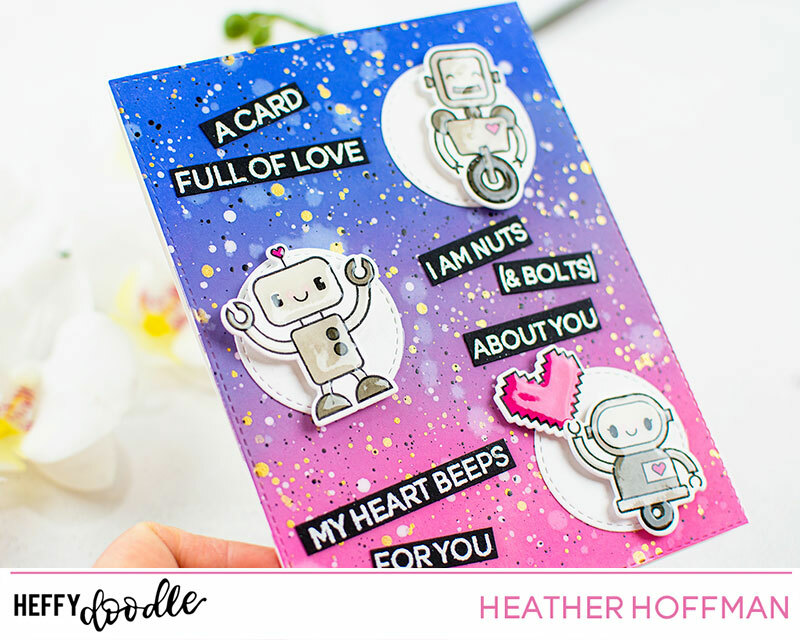 Cute and colorful robot card! Such a cute card! I love the colors and design!